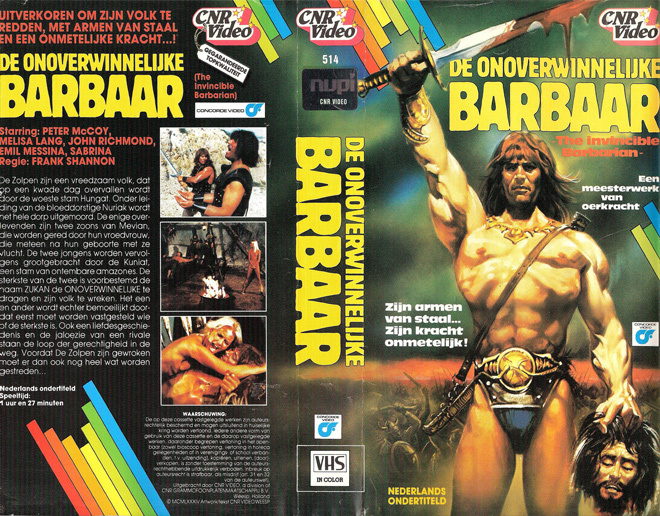 Here's a sample of the many different VHS covers for THE INVINCIBLE BARBARIAN (1982) starring Pietro Torrisi. I think I have this one on VHS somewhere in my collection but I didn't digitize it. I only have a murky Spanish copy of it. The funny aspect of these covers is how the hero has a beard or moustache and yet Pietro is clean shaven in the film. The Dutch cover is the only cover which represents Pietro somewhat correctly (he actually wears pants throughout the movie; see below). I'm still looking for a decent copy of this in English. This movie is also known as GUNAN - KING OF THE BARBARIANS. There is a German DVD of this film with an English language option but the transfer isn't very good.